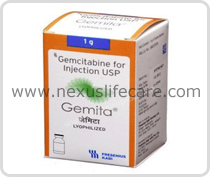 Uses:- This Gemita Injection has the capacity to treat Pancreas, Lung and Breast Cancer. Gemita Injection functions by preventing the growth and spread of cancer cells throughout the body. Side Effects:- Mild nausea and vomiting Diarrhea or constipation Swelling in hands, ankles, or feet, skin rash, numbness Drowsiness and hair loss.